What’s Up With T-Swift’s PJs? Lunchtime poll! Love them or hate them? 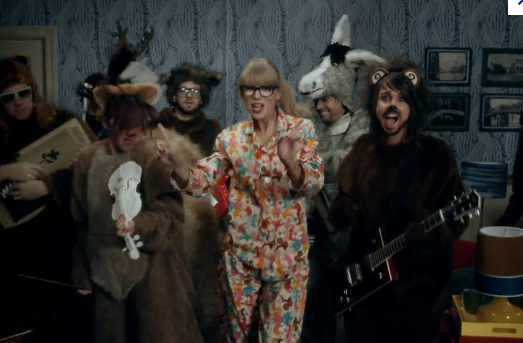 Taylor is sporting woodland squirrel pajamas in her new video for “We Are Never Getting Back Together,” and I think I love them. This video is on rotation on our ipad at home, and I have inspected the pajamas for clues as to their brand. (Also, I scoured the internet to no avail!) If these were Dream Lounge pjs, I would be shouting it from the rooftops. As an aside, did you know the video was shot in one take? Check it out here.